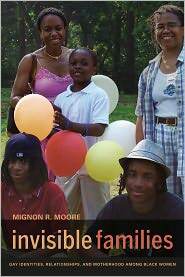 In her fascinating new book Invisible Families: Gay Identities, Relationships and Motherhood among Black Women (California Press), UCLA Sociology professor Dr. Mignon R. Moore brings to light the family life of a group that has been largely invisible-gay women of color-in ways that challenge longstanding ideas about racial identity, family formation, and motherhood. She followed 100 Black American and Caribbean-born lesbians for more than three years, and draws from interviews, surveys and field notes to explore how we come into the Life of being gay, how we find partners, form families, and live our lives in our racial and ethnic communities. Invisible Families is available for purchase at amazon.com, barnesandnoble.com, local bookstores and wherever books are sold. She will read from her book and sign your copy. Both events are FREE and OPEN to the PUBLIC – children are welcome!